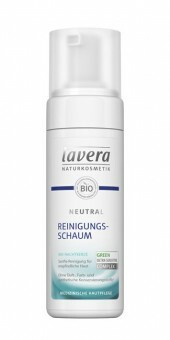 The mild lavera neutral cleansing foam gently and thoroughly removes dirt from the skin without irritating it. The pH-skin-neutral formula with organic evening primrose ensures a gently nourished skin feeling. Application: Shake well before use! Lightly moisten the face with water and gently massage the cleansing foam on face, neck and décolleté and rinse with warm water.